I am currently developing a new series of works that incorporates a simple paper folded form. 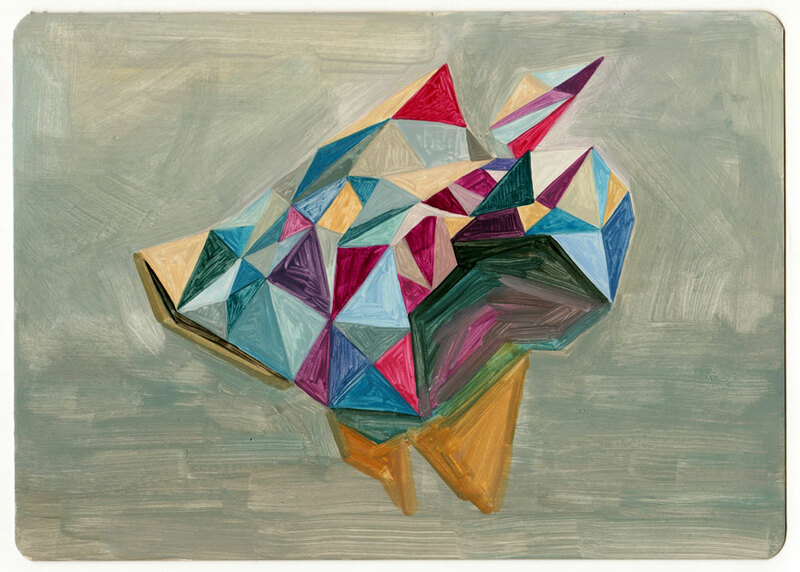 Focusing on how a folded shape can be transfigured at speed from a temporary structure (three dimensional) into a flat two dimensional space (painting and drawing). Each form can be squashed again, folded, opened, reconfigured and recorded. Coloured patterned tessellations that are on the surface of the paper suggest other spaces, angles and areas of illusion. I am interested in how the marked painted surface can be perceived as a spatial element and how this can interact with figures that are situated in the foreground in a painting. These depicted idiosyncratic shapes and scenes often have been assembled in the artwork to make anthropomorphic forms teetering between abstraction and figuration.